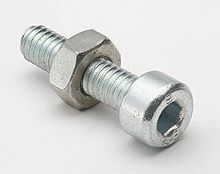 A nut is a type of fastener with a threaded hole. Nuts are almost always used with a mating bolt to fasten parts together. Thus "nut and bolt" or "nuts and bolts" are term which recognise their pairing. Like bolt heads, their shape is usually hexagonal, because this is best for gripping with tools. Nuts are graded with strength ratings like their respective bolts. For example, an ISO property class 10 nut can support the bolt proof strength load of an ISO property class 10.9 bolt without stripping its thread (the inside spiral groove). This page was last changed on 9 July 2016, at 07:54.